Leo Hickman in the Guardian asks where the debate is about fracking’s climate change risks, particulary on the second point. Yes it hasn’t been addressed much at all or very well. In the UK, the whole debate over the proposed raise in fuel duty (3p a litre), has been over the politics and “economics” of it (with a 19th paragraph quote form FOE in the BBC). I put economics in quotes as I have no idea whether the supposedly economic arguments are economic or more political-pseudo-economic. For those of us who would like a carbon tax (amongst other stuff), it’s not overly encouraging. But it also shows the disconnect in the media, between climate…and the disconnect that is the media impression of everyday life. Fracking is the ultimate good news/bad news, isn’t it? 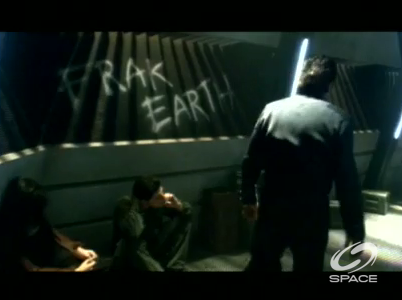 Nice Battlestar pic find! Also: Lou Grinzo’s been making this point repeatedly. As he notes, we’re going to get many chances – one maybe? – to transition our energy infrastructure. Building gas into its nervous system is suicidally stupid. Whether it’s any more suicidally stupid than anything else we’re doing at the moment, I couldn’t say. ps Adam: on fuel tax as carbon policy, I guess we’re already running that experiment, if one looks at the current differences internationally. The problem is that transport and productivity are still umbilically linked, despite a great deal of money being thrown at ‘decoupling’ the two. I see fracking as a counter to the Paul-Kelly-style argument of ‘we should align ourselves with anyone who has a goal in common’. Pursuing shale gas only makes possible sense, from a climate perspective, if you accept the urgency of reducing emissions, in which case if it genuinely is lower emitting than other fossil fuel sources then it could be used to replace those sources in the short and medium terms. However, for someone concerned by peak oil or energy security it is as likely to be an ‘and’ as an ‘or’. It’s probably not as suicidal as some of the other things we’re doing, but unless it’s actually replacing the jump off the cliff that’s little comfort. Sorry – *not* going to get many chances! Aside from the fact that Fracking (it really is the entire gas drilling industry, as wastewater wells are used in all cases. Fracking is just the new obsession that makes it worse going forward) is not helpful in reducing emissions, it really has never been proven to be safe for water contamination. Even Revkin is now publishing people who don’t go along with the USA gas cheerleading narrative. However, the oil folk I know are adamant that it is actually safe in practice. This doesn’t mean they are right, but I have seen enough to be sure that they are every bit as exasperated by press coverage of the issue as climate people are of the coverage of the climate issue. They are quite convinced that people are getting the wrong idea from the press. Can I vouch for the oil guys over the people quoted in the Pro Publica article? It’s not my field, so not really. But neither can I vouch the other way. The opinion of the Royal Society carries more weight for me than Revkin looking at Gasland. “Even Revkin” is a very strange way to put it. The trouble with Revkin and the rest of the press is their refusal or inability to filter out worthless junk, isn’t it? Safe in practice means safe given proper regulation and study which we don’t have as far as I can tell. Fox, even as a propagandist, is likely correct in his conclusion that there is no evidence that water contamination from drilling wells is a negligible problem and, also, has no solution at this time. The question that “activists” other than Fox are asking now, which is more interesting given that the gas price bubble may have popped, is whether or not proper regulation is too expensive to continue the planned massive expansion of shale fracking. “There’s no evidence that X is not a problem” does NOT constitute evidence that X is a problem. That’s true, but it doesn’t encapsulate the argument. I was a little bare in the wording. It’s more like we know contamination can happen, the technology for cementing isn’t well tested, regulations aren’t good enough, etc, therefore it is a problem that the industry has not shown to be negligible and has no solution to make it negligible. I think it is a matter of what question we ask. The oil guys you speak of would like the question to be something along the lines of asking for direct proof that water contamination is a huge problem and proof that the cement plugs aren’t good enough. We can’t really answer that question yet, as we don’t have the study and energy companies keep that stuff to themselves, <a href="http://www1.rollingstone.com/extras/theskyispink_annotdoc-gasl4final.pdf"unless it leaks out. But I think we are talking in circles a little. I agree Fox is a bit Micheal Moore-ish and that has it’s drawbacks. I don’t believe he actively lies tho. In the end, I can’t agree more with the idea that natural gas needs harsh regulation on its fracking, wastewater wells, and methane leakage. Unfortunately for those seeking to make the promise of wild profits off drilling, the regs will bite, especially if the price remains low. I’ve seen a paper in pnas that I can’t find that details a way to make gas a safe product, so I don’t doubt it, the question is whether we will do and who can we trust to make it so. And if that makes us move on to different energy sources, so be it. It’s true that GGWS actually arguably goes so far as to break the truth rather than bend it. But the technology for telling a convincing story based entirely on facts and plausible extrapolations that is nevertheless plainly false is nevertheless well-developed. Indeed, one could say that all of our problems boil down to this. There is, as I understand it, no relation between fracking and groundwater that is different than the relation between ordinary drilling and groundwater. The vertical bore is the only place that interaction occurs. There’s nothing speculative about that technology. The first [criticism] is that the idea of boundaries does not focus enough on the distinction between things with truly global effects and those that matter primarily at a local or regional level…. Monbiot seems to imply that environmentalists, as a body, believed in the immediacy of peak oil (this becomes a black and white certainty in the comments, inevitably). I’ve more or less ignored peak oil and assumed that many others have done likewise – am I wrong in this? Or has peak oil been a central tenet of environmental thought? Well done on Monbiot’s part, and very well written as usual. It’s beside the point too, as Dan M points out. And of course the issue isn’t – absolutely cannot – be treated separately from considering ALL carbon fuel sources, especially gas and coal which can both, at the right price, get built into the economy’s nervous system. This is a brilliant, hard-hitting comment making the ground-truth point very strongly. Perhaps the basis for a slightly longer article? We need to start getting as many people as possible realising this. We need to keep it in the ground, and until this is at least realised, we can’t even begin to work out how. Like Monbiot though, I’m doubtful that it’s at all possible. We may just be a peculiar kind of intelligent bacteria, able to be individually aware of what we’re doing but collectively utterly incapable of doing a fart about it. Yearly emission rates continue to increase. Don’t take my interest in local water contamination as I sign I’m thinking small. I’m pointing to it because, as everyone agrees, the only way to allow it would be through heavy regulation on the operation, building, maintenance, etc on the wells, for years following the usefulness of the drilling site. As I asked before, at what price of extraction and compliance with regulation does the fracking revolution end and the renewable revolution begin. That’s true, David. But the extent of frnacikg is increasing exponentially. And, the lateral drilling technique is relatively new, which has a lot to do with this. I think trying to brush these concerns under the rug is very short-sighted.